This summer just flew by. Some of my fondest memories I have as a child happened during summer break. Having just a few short weeks home with the kids means that we have to pack a lot of activities into a short amount of time. We usually plan a vacation in there somewhere and now we just have a few short weeks left. 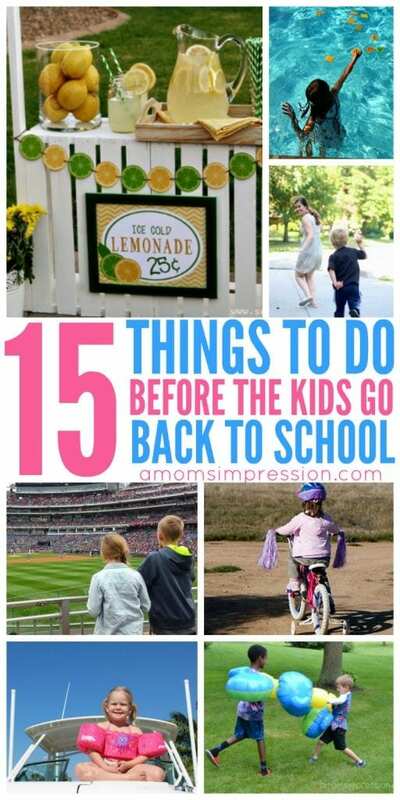 While we have just about run out of time I thought it would be fun to create a list of Things to Do Before the Kids Go Back to School! 1. Make root beer floats together. 2. Have a banana split family night. 3. Host your own backyard summer games. 4. Squeeze in a little more pool time. This swimming pool Scrabble game looks fun! 5. Complete this list of summer vacation ideas for the kids. 6. Hold a backyard concert with your kids’ favorite instruments or one of these fun sound walls. 7. Set up a lemonade stand. Better yet, serve lemonade to your neighbors for free! Who wouldn’t love a cold beverage on a hot day? 8. Go on a family bike ride. 9. Take the family to a baseball game. Keep the kids interested with this baseball game scavenger hunt. 10. Go fishing. A day at the lake sure sounds relaxing! 11. Visit the zoo, and take this zoo scavenger hunt printable to see how many of the animals you spot! 12. Have an epic water balloon fight. 13. Too hot to go out? Take a pajama day. Stay indoors and relax together. 14. Go stargazing at night, and let the kids work on their knowledge of constellations with these constellation sewing cards. 15. Plan a family boat day. Don’t forget the sunscreen! Take these last few weeks of summer and make the most of them. These memories will stick with your kids for years to come.